What Is Telecommuting and What Are the Pros and Cons? Telecommuting (also known as working from home, or e-commuting) is a work arrangement in which the employee works outside the office, often working from home or a location close to home (including coffee shops, libraries, and various other venues). 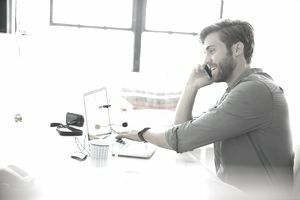 Rather than traveling to the office, the employee “travels” via telecommunication links, keeping in touch with coworkers and employers via telephone and email. The worker may occasionally enter the office to attend meetings and touch base with the employer. However, with many options for distance conferencing, there may be no need to visit the office. About 3.9 million U.S. employees, or 2.9 percent of the total U.S. workforce, work from home at least half of the time. There was a 115 percent increase in telecommuting between 2005 and 2015 (3.9 million employees in 2015, up from 1.8 million in 2005). The average telecommuter is 46 years of age or older, and 50 percent of telecommuters are 45 or older. Approximately 53 percent have at least a bachelor’s degree, compared to 37 percent of non-telecommuters. The average annual income of telecommuters is $4,000 per year higher than those who work on-site. About the same number of women and men telecommute. Full-time employees are four times more likely to have the option to work at home than part-time employees. Forty percent more U.S.employers offered flexible workplace options in 2017 than did in 2010. There are many benefits to telecommuting. Telecommuting allows a worker greater freedom regarding his or her work hours and work location. It gives the employee more flexibility to balance work and personal obligations. Often, working from home can make you more productive, because you do not have the distractions of an office space. There are also many benefits to employers. Allowing workers to telecommute often makes them more productive, which benefits the company. Telecommuters are also likely to be happier in their jobs and are therefore more likely to stay with the company. Telecommuting even saves companies money in office expenses. However, there can be downsides to working from home. You have to be extremely self-motivated, or else you may get distracted easily. You also need to find a productive place to do work, such as a home office or coffee shop. Some people also find working from home to be a bit isolating, because you are not around your coworkers. When considering a telecommuting job, it is important to weigh these positives and negatives. Many industries offer telecommuting jobs. Some of these industries include sales, customer service, and marketing. Many jobs in technology (including computer and software programming) can be done via telecommuting. Some medical professionals, including health claims analysts and even some radiologists, have begun to work from home. You should come up with a strategic plan if you want to ask your employer if you can telecommute. First, decide what kind of schedule you have in mind (do you want to work from home full time? Come into the office part-time?). Then, be sure you can explain how your telecommuting would benefit the company (Would it save the company money? Would you be able to increase productivity?). There are steps you can take to finding a telecommuting job. You can look for jobs at companies known for hiring telecommuters, or search job sites geared towards telecommuters. You can find more information on how to find a work-from-home. One thing to be careful of is job scams. Many scams promise applicants easy money at a work-from-home job, but these are almost always tricks for taking your money or your identity.